When it comes to statistics and numbers, there’s one we love more than any other: customer engagement. Forget sheer numbers of pageviews, followers and customers. The most important factor in good community is engagement. That’s how you know that people are really responding to you and your services. We’re talking about how people identify with you and their connection. Engagement is all about building a strong, loyal relationship. That’s how you get repeat customers and a strong reputation. So, how exactly do you encourage and build this? That’s what today’s post is all about. Communication and engagement is a two way street. Tell people your story and show a personal side. Explain what drives you to create this product or service and why it matters. Show some passion and excitement. This is immensely powerful when it comes to engagement. First of all, passion is infectious. When you show excitement, it helps convert your customers and build a mutual passion between you. Secondly, it shows a human side which is easier to engage with. This may seem like a silly suggestion. But, quite simply, tons of businesses ask us how they can be more engaging. We take one look at their channels and they haven’t even attempted it. As a business, it’s your responsibility to put yourself out there and encourage engagement. Start conversations and ask questions. Get feedback from your community and encourage participation. Actively ask users to comment on your blogs and interact on social media. Of all the digital channels available to you, we still love a good old email! There is still no better way to make a personal connection with an individual customer. Tailor your email marketing to specific customers. Use their first name in the subject title and strengthen that personal connection. Tap into their emotions and engage with them. Ask them to engage with you by visiting your website. Remind them why you’re important. We’ll get straight to the point, the future is in mobile technology. It’s fast becoming an amazing way to engage with your loyal customers. If you haven’t already thought about mobile app development, now’s the time! You can use it to offer discounts and notify customers of new products and services. This is another way to make a close, personal connection with your customers. It will come as no great surprise to find social media on this list. Facebook, Twitter, Instagram et al have completely changed customer engagement. You can now open up a communication with your customers in real time. You can get feedback and build a close community. Take the time to reply to customers who engage with you. And actively encourage engagement in return. Share exclusive offers and discounts with them and reward loyalty. Quite simply, online engagement is all about treating customers like real human beings. After all, that’s exactly what they are! Don’t let the internet dilute the personal experience you can provide. In my opinion, telling your story to the audience is the best way to draw them in. Many of the corporate leaders use story telling as a strategy to motivate their employees. However, the most important thing would always be customer engagement. Engagement drives more engagement. The more your customers engage the more your business has the potential has to grow. Establishing a Real relationships, Brian. Thanks for visiting and commenting today. 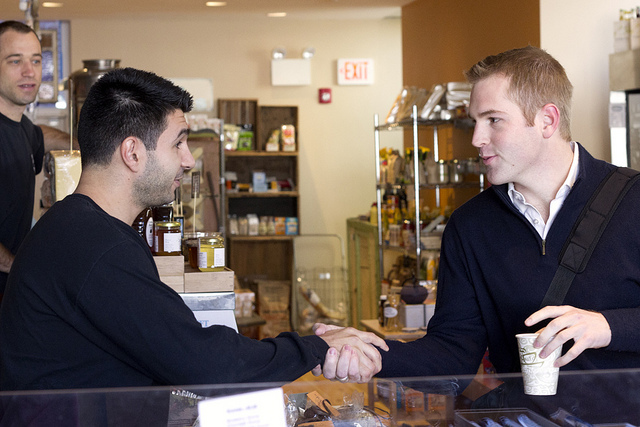 Getting personal with customers can help build trust faster. If the customer understands the personal angle of business then it would be easier to engage and convert. Many bloggers make the mistake of concentrating on traffic instead of engagement. I agree with these tricks there would be improvement on online engagement. Interacting with social media and utilizing emails effectively are effective engagement options that would make acceptable difference! Erik: Could you give an example of a company that has been good at improve the engagement? Erik – All are excellent points. I would also state the obvious which is to engage with the customer rather than making the conversation a one way street. By letting customers a chance to speak up and provide input and engaging them in a dialog will help improve the relationship and customer engagement. It must be a two way conversation. Asking questions, contests, giveways, chat, polls…everything helps!